If I could give this salon a ZERO I most certainly would. It is the most unprofessional salon I have ever stepped into and they completely destroyed my hair. Jennifer was my stylist and I asked her for a darker brown than what I am to cover up the orange looking color my hair faded into. The entire time she was coloring my hair she was talking about how drunk she got the night before...she was coughing into my hair...playing with her belly button ring and acting like a complete fool. I usually ask to leave my hair wet after coloring to save on the price of a blow dry (plus she typically is pushing me out the door anyway)and I left leaving her a fifteen dollar tip. When I got home to dry my hair my hair was PITCH BLACK. It looked like a cheap witch wig. No dimension whatsoever and nothing at all what I had asked for. Here's the kicker...MY WEDDING DAY IS A MONTH FROM NOW! Crying my eyes out and completely baffled, I called the salon and told Jennifer that she had to fix my hair because it was jet black. She told me to come back to the salon and promised to fix it. I get to the salon and she has me sit down at a sink where she starts putting something in my hair..it smells like straight chemical. Anybody that knows hair knows that if you're doing a color removal you have to do it SLOWLY and GENTLY as to not completely damage the hair. Well Jennifer apparently didn't have time for that because she put BLEACH on my hair. When I asked her if it was bleach her response was "wellllll.. yeaaaahhh.." Now I am completely fuming because she did not even tell me what she was doing before she started applying these harsh chemicals. She finishes...goes to blow dry my hair and it is exactly the same. Completely flat dark black witch hair. Atrocious. I call back and tell her I need my money back...go there...she gives me the money back and KEEPS her FIFTEEN DOLLAR TIP!! If this is all not bad enough..I later find out that the OWNER OF THE SALON was standing next to us the ENTIRE time! She never once introduced herself or spoke to me about the situation even when I was standing in front of her salon literally bawling my eyes out explaining it was one month until my wedding day. After years of considering a keratin "Brazilian" hair treatment, but unsure if it was right for me, Jennifer Fournier Laforest has done an incredible job. She wasn't pushy about it, as some hairstylists have been in the past, and rather very clearly explained how the treatment worked and honestly laid out what I could expect from it. I'm so happy I took the plunge! I also wanted to shake things up a bit and put some purple in my hair, but was concerned about my professional image. She suggested that we do the strips of purple slightly underneath my top layer of hair, so it would show only if I wore my hair in a certain way. Again, perfect solution. Very grateful for Jennifer's experience and expertise and would highly recommend her. Jennifer LaForest is fabulous! I am a repeat customer and she always greets me like a friend, gives me great advice and a fantastic cut! Recently did low and high lights and walked away feeling like a million dollars! I would recommend Jennifer LaForest to anyone looking for a great experience, and a consistent and fabulous hair style. When I moved to Florida from Connecticut I was very apprehensive about finding the right person to color my hair the way I had been enjoying for years. I found her! Nikki listened to my concerns, reviewed my formula and the color product I had been using, and made it an easy transition. She is skilled and will suggest new and edgy ideas if you are looking for a change. She is also an incredibly nice and caring person. Every visit is enjoyable with a great result. What more could a woman want? I needed a new hairstylist and a friend recommended Nickki Archer at Bradenton Salon43. Nickki gave me the best color, highlights and a new stylish cut. Nickki was very friendly and easy to talk to, the salon is being remodeled but there was no dust or unpleasant vapors. The products she used gave my hair a shiny healthy look with volume. I have been to this Salon twice and plan to make Nickki my permanent stylist. The service was great the prices more than reasonable. Salon43 has their own website which makes appointments and requests very easy....Try Salon 43 I'm sure you will also be pleasantly surprised. Jennifer Fournier LaForest at Salon 43 gave me the best hair cut! I needed texture and volume and had been disappointed by my last few cuts at other salons. Jennifer was awesome, so friendly and cool, and gave me a gorgeous cut! Had dyed my hair a burgundy red color and was getting tired of the upkeep and wanted to return to my natural blonde color, Jennifer did the BEST job on my hair! Took the time to make sure we were getting exactly what I'm looking for, and that it was done properly. Never been more satisfied with someone doing my hair! Be sure to ask for her when you need your hair done ! Marina is an awesome hairdresser! I am very satisfied with the color and cut of my hair. I showed her a picture of what I wanted done with my hair and she made it happen! This salon has great service and I recommend Marina! She does a great job! Kristy is incredible. She picks out my color for me which looks amazing every time. I will not ever go any where else or allow anyone else to do my hair she's awesome n amazing. I love Salon 43. Kristy is wonderful. My hair has never looked or felt so good as it did when I left there. Not only is she the best hairdresser, she is very friendly and just an over all nice person. I will not go anywhere else to get my hair done now that I have gone there. Way to go Salon 43, keep up the great work. 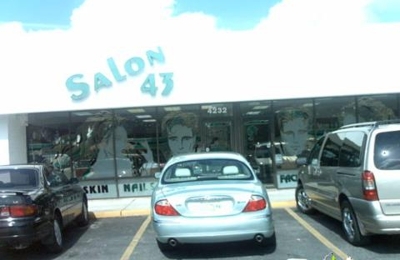 I'm so fortunate to have found Salon 43. Esp Jennifer!!! She is a godsend!!! I've been to practically every other salon in the area and have always had a problem or been unhappy. I finally discovered S43 after so many bad experiences. I asked for the best colorist at S43 when I made my 1st appt, and I was so happy to have been hooked up with Jennifer. My hair looks better now than it has in years. Esp when it comes to coloring. That is where her true artistic talent shines! She fixed a terrible job that I had done at another salon, (and believe me, it was NOT an easy job) and also gave me a great cut. After speaking with her about what I wanted, showing pics, she gave me gorgeous color and a cut that is perfect for my skin tone and also my face shape. She is definitely a pro. She is also consistent. I know what I'm getting every time I go in. I'm SO lucky I found her and would never go to anyone else. Whenever I get my hair done, I, without fail, am always happy. And as a bonus, she is always pleasant and makes me LOL!! Just enjoyable to be around. I always look fwd to my Appts. As an aside, I moved here from NYC, so I tend to have high expectations, and she met every one of them. She's on par with the best of them! Thanks Jennifer, and thanks Salon 43 for being smart enough to have her on your staff. If she were to ever leave, I would follow her. Once again, thanks so much, and I will also continue to recommend my friends and all those that compliment me on my hair to go to her if they want a job well done. Thanks again!!!! I've never, ever had a problem with this salon I've always been treated pleasantly AND professionally. I've been have Jennifer do my hair for at least 6 or 7 years and I followed her to Salon 43. I've never been disappointed and always come out completely satisfied. My Girl Jennifer is always on top of her game when it comes to my hair! I am always unsure of what exactly I want I give her the basic not much help of what I want and with her years of experience and professionalism she listen and gives me exactly what I want when I leave. Great atmosphere, everyone is friendly, great conversations never leave not smiling or laughing out loud with everyone. I am truly grateful that Jennifer is always willing to take me in on last minute appointments. Absolutely wonderful. Jennifer is my hairdresser. I recently moved to Apollo Beach and my plans were to find a hairdresser closer...I did!!' My appointment with my new hairdresser in Apollo was on Tuesday..Wednesday I called salon 43 to get an appointment to have my hair fixed...the drive to Bradenton is welcoming...I will keep Jennifer and enjoy my drive from Apollo Beach to Bradenton. Jennifer is great with color..she knows her stuff. As far as price, it is reasonable.